Dark Horse Comics February solicitations have bolted from the starters gate. Of all the cover art racing for your dollar, here are the four strongest shots of art coming round the final corner. 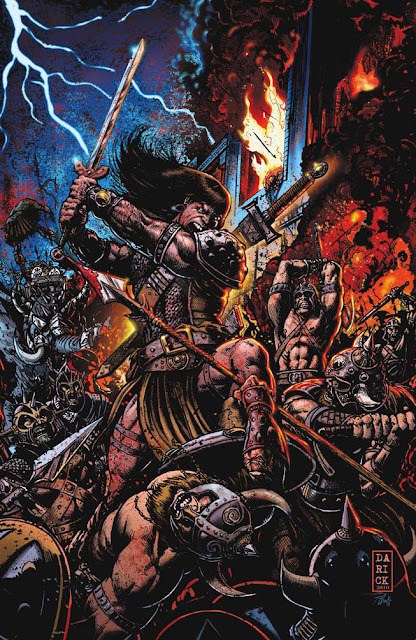 ONE TO WATCH: KING CONAN: THE SCARLET CITADEL #1 Darick Robertson was born to draw Conan - just look at how savage that battle scene looks! It really does feel barbaric! ARTIST AND TITLE: Yoshitaka Amano - Vampire Hunter D Vol16: Tyrant's Stars (Part I and II), Chris Hastings and Les McClaine - The Adventures of Dr. McNinja: Night Powers (love that name! ), and Tsuneo Sanda - Star Wars: Darth Vader and The Lost Command #2. More Dark Horse goodness after the jump. I have loved Yoshitaka Amano's work ever since he did Sandman: The Dream Hunter's. His work is just so hauntingly beautiful. till this day the first Vampire Hunter D flick is still among my top favorite anime movies.Vampire Hunter vs. Blade, now that would be one epic f@#$%& battle! I agree RN - there's definitely something haunting in his delicate style. Even when he drew Superman! Funny you mention Blade David - we were just talking about vampire movies before and were talking about Blade taking on Dante from Devil May Cry, but you're right Vampire Hunter would be pretty cool!